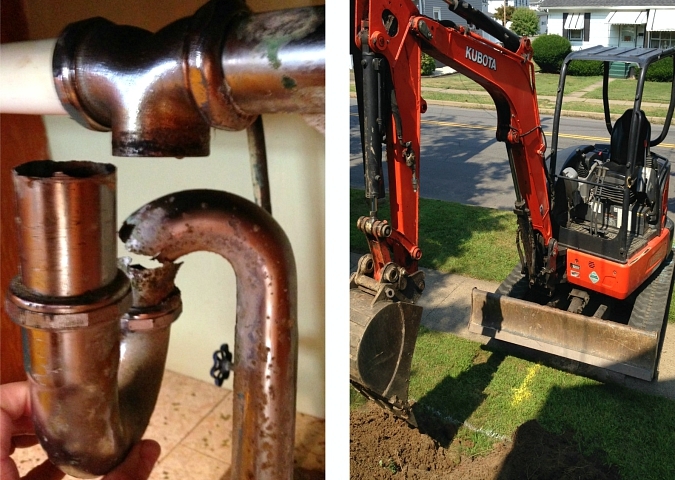 love, laurie: water pipes and sewer lines and underground excavation, oh my! water pipes and sewer lines and underground excavation, oh my! remember that famous line from the wizard of oz: "lions and tigers and bears, oh my!" dorothy, the tin man, and the scarecrow chanted it as they made their way through the woods right before they met up with the cowardly lion in the movie. we felt a little bit like the wizard of oz characters this week, blindly making their way through the forest, except our chant was a bit more along the lines of: "water pipes and sewer lines and underground excavation, oh my!" being home owners has been one of the most rewarding and frustrating things that we have ever done. it's great when everything is going along fine and working well, but let me tell you, when it rains it pours. it all started with a little drip from the kitchen faucet. before we knew it we had several major problems on our hands. in the last week we have had to rip out our front yard to repair a sewer line in our yard, put the yard back together, rip out more of our front yard including our sidewalk to repair more sewer line in our yard, put the yard back together again, majorly clean up our basement from the sewer line issues, and then to top it all off rip out the plumbing for our kitchen sink and replace all of it. it has been a stressful, exhausting, and very expensive week. however, i'm happy to report that as of yesterday afternoon i do believe everything is finally fixed. thank goodness! i'm keeping my fingers crossed that everything holds for a while and that we don't have any other issues for a bit! Whew!!! All of that is just too much to handle when it all happens at once! Quite exhausting, indeed! Pretty soon the house will be brand new with all the major repairs. Hope you have a run of no repairs for awhile. Do like that little machine in your front yard.